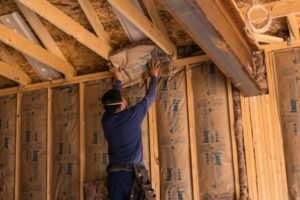 In 2016, Reyes Blanco and Juan de la Cruz began their dream of owning their own business – Midwest Insulation. Although Juan and Reyes own their own company, they say they had no idea how to run a business. “We realized it was complicated. But it was the best thing to happen because we became stronger that way,” Reyes says. Six months later, Juan and Reyes still struggled. They debated selling their business. “We decided not to sell the company,” Reyes says. 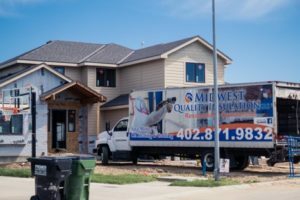 A Midwest Insulation truck parked at a house to begin on site work for the day. Seven months after they started the company, Juan and Reyes tried to find ways to get materials and a truck to support their business. “You need two or three years to make sure the company is successful. If not, the debt is too big,” Reyes says. The partners needed the right resources and at least $55,000 to be successful. However, when they went to the bank, the banker asked for a business plan. “We didn’t even have a business plan,” Juan says. Juan and Reyes turned to the Midlands Latino Community Development Corporation (MLCDC) for help. The business received a $10,000 loan from MLCDC and through a referral from Marta Sonia Londono, MLCDC executive director, they found another $40,000. They also learned how to write a business plan through classes at MLCDC. “After they helped us, we were able to buy the truck for foam. And we just got another. So, we’re growing a little bit,” Juan says. As of June 2018, Midwest Insulation operated five trucks and employed six workers. Reyes says the most difficult part of the job is that payments come through three months after the job is done. Insulation is added to the walls of a house by a Midwest Insulation employee. Juan and Reyes say their commitment to quality sets them apart along with a combined 17 years of experience before Midwest Insulation. In addition to running the company, both Juan and Reyes work on site for Midwest Insulation. For them, it’s been a challenge to prove they can do the job. Juan says it’s stressful, but it’s different when it’s yours. Their goal is to keep growing and be No. 1 insulation company in Nebraska.